Some people might consider a graham cracker a cookie. After all, it's quite sweet all by itself. But if you want to transform these old-fashioned crackers into an addicting confection, then by all means follow this vintage recipe by Dot, found on a recipe card in Olive Facey's vast collection. These graham cracker cookies are a variation of another recipe in Olive's collection called chocolate bark, in which a caramel mixture is poured over soda crackers (and then topped with chocolate). 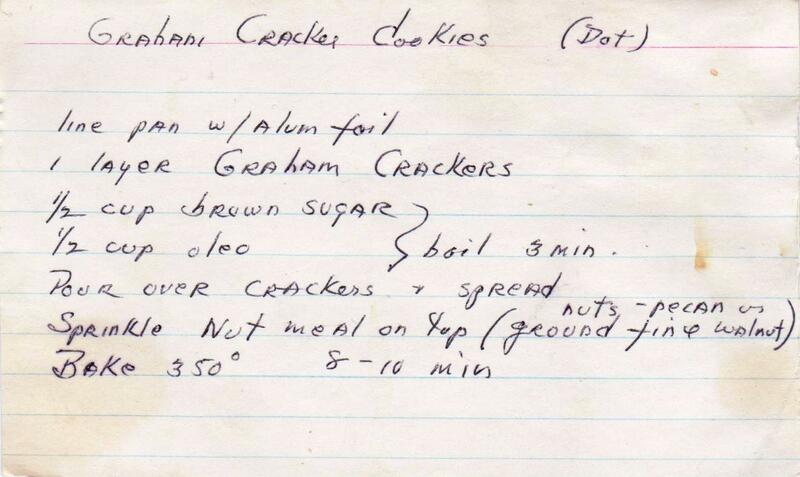 The famous matzoh butter crunch recipe is a derivative of that, as I suspect are these graham cracker cookies, leading one to ask, Is there nothing new under the sun? But whatever the genesis, these are delicious and very easy to make. First line a pan (I used a 9 x 12, but next time I'd do a 9 x 9) with aluminum foil. Place the graham crackers on top. Place the butter (even though the recipe calls for Oleo, use butter) and brown sugar in a saucepan and heat (while ignoring the dirty stove top). Pour the hot liquid mixture over the crackers and top with finely chopped nuts. I forgot to photograph this step, but you can see from the photo below (taken after baking), there wasn't quite enough topping to cover the crackers. No matter, just use the "good" parts and you can still eat the naked grahams. After removing the pan from the oven, let the cookies cool for a while in the pan until they stiffen up a bit. Cut into serving pieces and enjoy. My aunt used to make these and called them praline cookies. They were always my favorite! That's a much more appealing name, Jennie. And wish you were close by to try some. Thanks for writing. I'm so glad I have everything I need to make these right now. I can't wait! Part of the beauty of these, and so many old recipes, is they can be made with ingredients found in most pantries. Thanks for writing, Dawn. Thanks so much, Penny. I do think that back in the day, a treasured recipe was a point of pride -- and always signed the way an artist would sign a painting.